Some of you may ask yourselves, "Why do these cats call themselves The Cats of Ashton Hall?" Well, it is a bit of an inside joke. You see, Vicki comes from a long line of Lawrences that can be dated all the way back to A.D. 916 to a fellow named Lawrence the Monk (he was an Archbishop of Canterbury). A couple hundred years of begets went by, and eventually a fellow named Sir Robert Lawrence had a son (in A.D. 1150) that he named Robert. Robert built a home (fort/castle) and named it Ashton Hall. 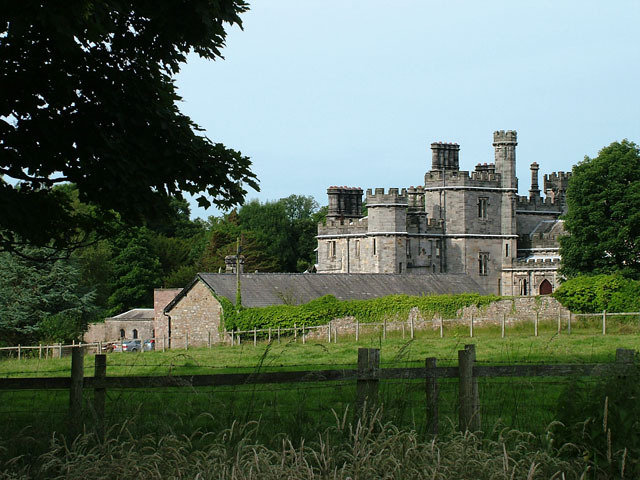 The home is located in Lancaster, England, a town which has had its share of Ashtons live in it over the years. Centuries passed, and eventually, in the 1630's, John Lawrence settled his family in Charlestown, New England. 360 years later, in the year 1990 Vicki Minor (of the family Lawrence on her mother's side) married Daniel Ashton. These two ancient families had, at long last, come together under one roof. I was the first addition to this new little family, and the rest of the cats joined up as the years went by. When we decided to create our own blog, we, being cats, liked the sound of all this pedigree, and decided to latch on to the old homestead name as the title for our blog. There, I think that about sums it up. Any questions? A very, VERY large dog used to visit the kitchen. His name was Dooley. But, since we cats don't venture into the world of fleas and traffic accidents, we don't meet many other cats, dogs, or otherwise. Of course aside from the six of us there are three birds and a fish here.